Written by: Elroy Schwartz. Directed by: William D. Russell. An old friend–Louise Marshall–re-enters Uncle Bill’s life. Meanwhile, Cissy finds a new friend, Sharon.You can tell that Sharon is sophisticated because she describes herself as “between mothers,” with the third one having left recently. She’s also a total you-know-what stirrer, who convinces Cissy that Uncle Bill will marry Louise and ship the kids back to Terre Haute. Sure, Sharon looks sweet here, but she sets a total Davis weep-fest in motion. 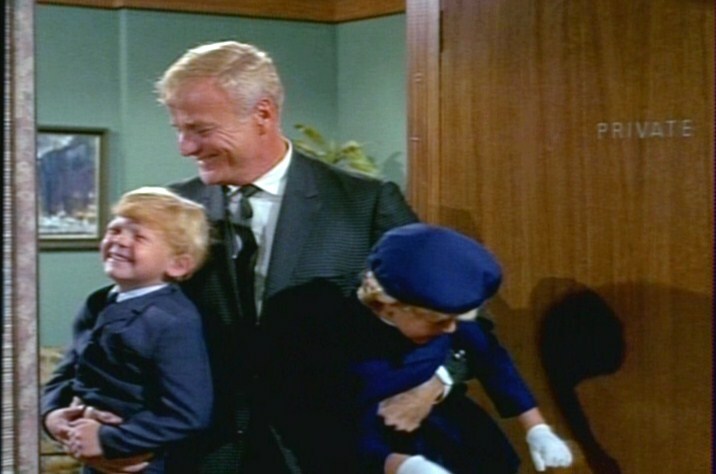 Cissy’s first impulse is to make sure that she and the twins are meeting Uncle Bill’s every need, so that he has no wish to marry. At her age, she should be able to see the fatal flaw in this plan. The kids “help” Uncle Bill prepare for an evening out. 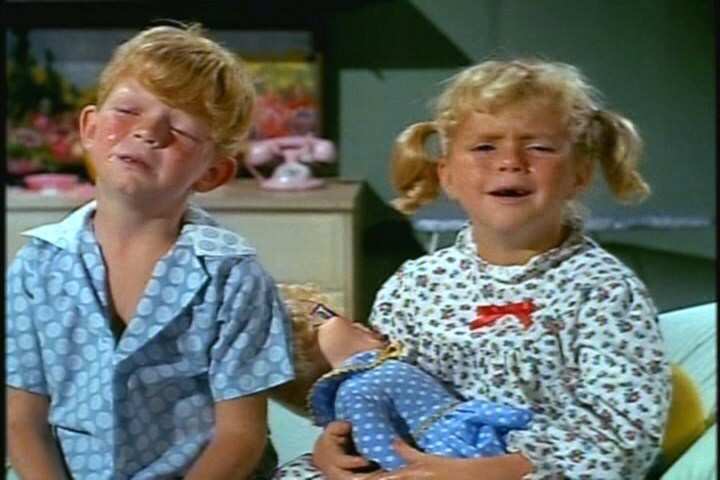 When that doesn’t work, she shares her fears with the twins–way to go, Cissy! Soon, everyone is bawling. These tears aren’t terribly convincing. This episode gets way too maudlin, but it has a few nice moments. 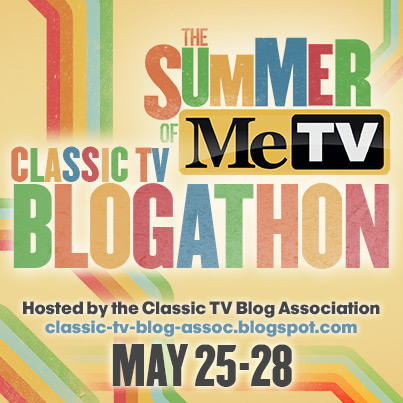 Elroy Schwartz is the brother of Brady Bunch and Gilligan’s Island creator Sherwood Schwartz and a prolific TV writer in his own right. His Brady Bunch writing credits include the one where Marcia and Greg run against each other for student body president and the one where Tiger gets lost. Ted Gaynor: John Hubbard. Sharon James: Sherry Alberoni. Louise Marshall: Rita Gam. 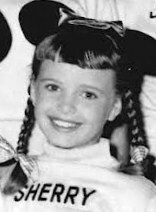 Sherry Alberoni was a Mousketeer in 1956-57. She worked frequently in TV in the 1960s and would appear in several more Family Affair episodes. In the 1970s and 1980s, she provided many cartoon voices, such as Wendy in Superfriends. Rita Gam won a Golden Globe as Most Promising Female Newcomer in 1952. She’s best known for serving as a bridesmaid for Grace Kelly, a subject on which she’s given many interviews. 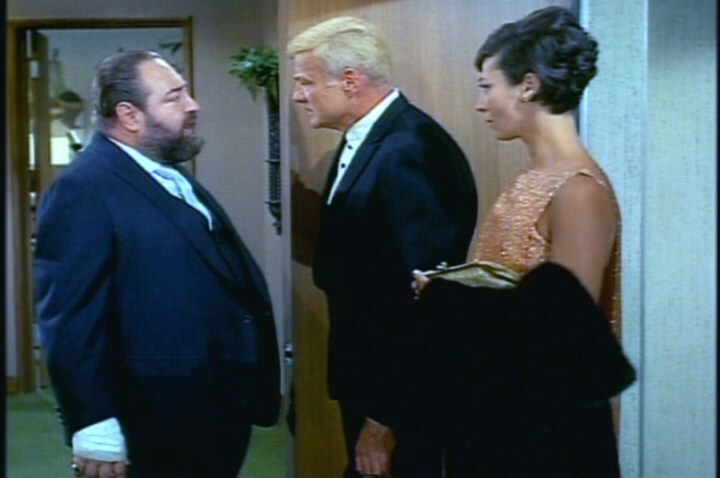 Rita Gam must have been very tall or worn mega heels to achieve a height so close to Brian Keith’s. Cissy is good at chemistry. Sharon lives in apartment 12B. Uncle Bill is a Korean War veteran. This episode is filled with poignant references to abandonment and separation in Terre Haute. Read my whole Family Affair series! 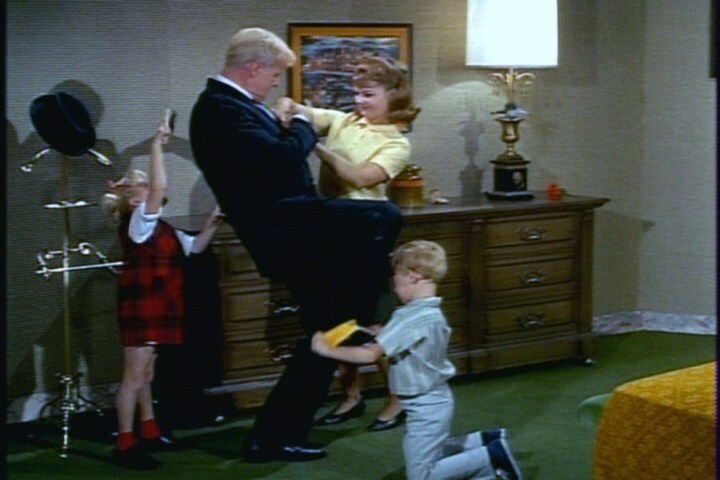 This entry was posted in Family Affair, Television, Uncategorized and tagged 1960s, Anissa Jones, Brian Keith, Classic Television, Family Affair, Johnny Whitaker, Kathy Garver, Nostalgia, Rita Gam, Sebastian Cabot, Sherry Alberoni, Television. Belated Happy Birthday to you. As a huge Family Affair fan right from the start of the series, I like your FA Friday (rather FA Saturday in Germany) a whole lot and look forward to each installment, particularly the bonus features. Thanks for a really great blog. Thanks for the birthday wishes and thanks so much for commenting! I’m delighted to know that someone is enjoying the Family Affair posts. (I’ve noticed that I get a bunch of views from Germany on the weekends–also Italy.) I have a lot of good stuff to post as bonus features in the weeks ahead. Thanks again for reading, and feel free to comment any time!